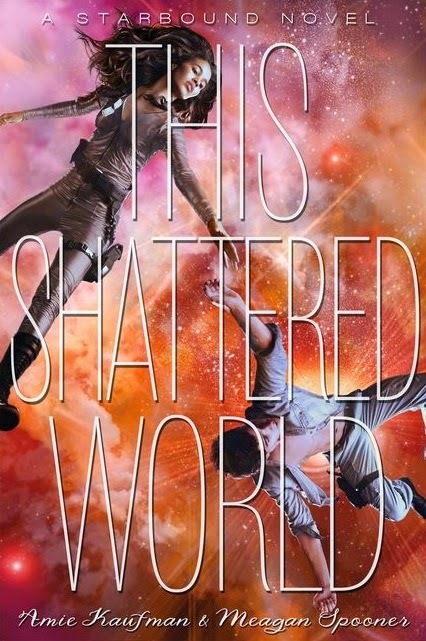 This, ladies and gentlemen, is the absolutely beautiful cover for This Shattered World, the companion novel to These Broken Stars (one of my favourite reads of 2014 so far) and the second novel in The Starbound Trilogy by Amie Kaufman and Meagan Spooner! Isn't it absolutely stunning? This Shattered World is to be published on Dec. 23, but it was also recently announced that an e-novella called This Night So Dark, will be coming out on October 7th! THIS SHATTERED WORLD is a companion novel, set in the same galaxy as book one in the Starbound Trilogy. Six months after the events of These Broken Stars, the second book in the trilogy follows a new pair of star-crossed lovers—one a rebel fighting for his home, the other a soldier, her mission to eradicate the rebellion—facing down a powerful darkness hidden in the wilderness of a newly terraformed world. I cannot wait to delve deeper into the Starbound world and experience another blood-pumping adventure! Let me know what you think of the cover! Are you as excited as I am? The first book was titled "These Broken Stars" right? Ugh, I feel so left out, I haven't read the first book. And their covers are both so pretty, I really should read the first book asap, but I'm thinking if I should wait til all three books are published. Yes! I absolutely loved These Broken Stars! Since the books aren't exactly sequels, they're companion novels, you don't really need to read them all at once as they all follow different characters and storylines! But I definitely recommend it! To be honest, I kind of like the cover of These Broken Stars more, but this is still a gorgeous cover! <3 Thanks for sharing! I agree! But they're both stunning. I love how similar this design is to the first book. One look and you know it's the sequel to These Broken Stars, which is cool. Personally, I like the TBS cover better but this one's nice too =) I hadn't heard about the novella yet, I wonder which couple it will follow? So excited! i'm totally in love with this cover and if this sequel is anyhitng like the first than i have no doubt i'll be crying readin this one too! I loved These Broken Stars immensely and I'll probably be crying for this one too! I'm with you sister! I just received These Broken Stars FINALLY! I love these covers. I also love your blog so much! Did you make it yourself, or buy it/have someone else make it? This book was amazing, it makes me happy knowing that more people are reading it! Thank you so much for being so kind! I actually did the entire blog myself, it took a little while but I guess it was worth it! I completely love it! What a role reversal, in comparison to These Broken Stars. Can't wait for it's release. TO FAR AWAY! Isn't it stunning? It makes my heart happy just looking at it. And yes, I'm so impatient! I want it now!